The Neat Company can be very handy during tax season, especially for affiliate marketing. Have a pile of receipts for an expense report or small business taxes? Maybe your home taxes are a little more complicated. If you’ve let your documents pile up, or even if you only have a few, check out the scanners from neat.com. Organizing your invoices and receipts can be a fast and easy process; and the scanners can handle multiple documents at once. Once scanned, the information is easily accessed and exported and makes submitting your taxes a breeze. 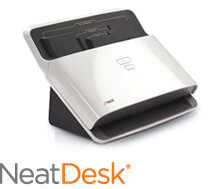 The NeatDesk is a high-speed, duplex desktop scanner and Digital Filing System. Scan multiple receipts, business cards and documents in one batch. The information is read and receipts become digital records with vendors and amounts, business cards become digital contacts, and documents become fully keyword searchable. Make quick work of your paper clutter and tax season less tedious. The Neat Company takes a straightforward approach: organize and simplify. Scanned documents are available on your desktop, in the cloud and with a mobile app. Once scanned, the information can be accessed whenever and wherever you need. Neat offers affiliate partners 8% commission, a 45 day referral and exclusive promotions. All affiliates are encouraged to join the Neat Company affiliate program and will be notified of this season’s tax promotion. Affiliate partners can sign up directly through Commission Junction, as well as contact Versa Marketing Inc. for more information and assistance getting started.